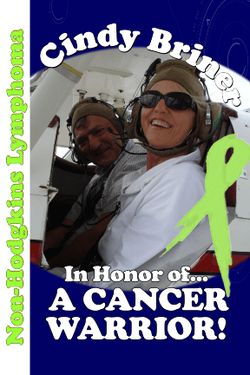 "I am Cindy Briner & was diagnosed in 1998 at the age of 43 with Non Hodgkins Lymphoma, Stage 1A. With a positive attitude, a loving husband, 2 great kids and surrounded by wonderful family & friends I was able to beat cancer. It was actually my dentist & a coworker who encouraged me in the beginning to find out what that "lump" on my neck was. So here I am 17 years in remission & advocating early testing/screening. Together we can find a cure for cancer!"